The new media for marketing communications is personalized retrieval pages and our service auto generates them from a photo or video event activation. 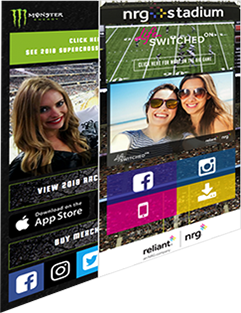 Event participants can retrieve their photo or video from the retrieval page and this opens the opportunity for the brand to deliver their message right on mobile! With a customized and branded retrieval page the brand can deliver short form video, CTA’s, download apps, links to anyplace and branded social sharing. A marketer’s dream is to have the prospect on a webpage controlled by the brand – now you have it! Take them through your sales funnel and bring them home to daddy! No app required. All photos can be shown in a fun and entertaining digital display onsite and interrupted with brand video and messaging. The retrieval page is totally customizable for the brand creatives using a client friendly control console. Drive web traffic and increase SEO. Robust reporting including the number of photos or videos uploaded, sharing rates and what platforms, retrieval page views, video views and clicks throughs. For multiple events we can even put the numbers side by side, so it is easy to compare. Great for events and digital only campaigns using incentivized value exchange UGC by texting in a photo or SMS to our short code. As an event marketing agency do you have a need for any of these outcomes?